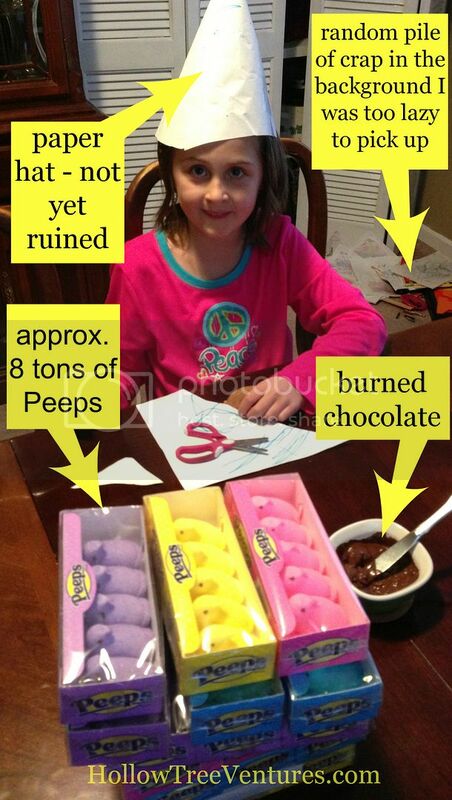 Last week I was issued a challenge: attempt a Peeps-based craft or recipe. I call it a "challenge" because I'm not a fan of making non-edible crafts with food (sorry, I don't want a shellacked vase of Peepsickles in my foyer, no matter how adorable they are), yet I had to rule out recipes because, after years of abuse, my kitchen has finally taken out a restraining order against me. And a fashion project was born. In hindsight, I should've just shellacked them and hot glued them to a hat. But I hate to waste food, plus my kids were all excited to eat the Peeps and I didn't want them to burn their tongues on the glue. So, I came up with an ingenious idea which, you'll be surprised to hear, turned out to be really stupid. First I melted chocolate chips and a little oil (to keep it from hardening back up immediately) in the microwave. And by "melted," I mean my kitchen would still smell like charred chocolate if I hadn't recently done a bunch of research on removing food odors in your kitchen. And no, I didn't plan this whole thing just so I could link back to that article. I think it's just the universe's way of forcing me to see the bright side of things, via failure. Nextly, Jake and Zoe made their hats and covered them in waxed paper. 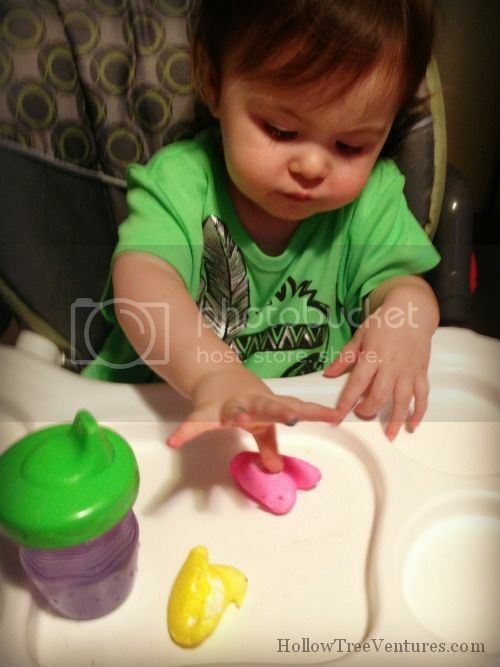 At this point Maddie started getting restless so I gave her a few Peeps, but she didn't seem to recognize them as food items, which was probably for the best. It didn't take long to realize the chocolate charcoal wasn't cutting it in the glue department, so I got the next gluiest food I could think of - peanut butter. The peanut butter led to sort of a mudslide effect, which is when my helpful husband pointed out that Peeps are made of marshmallow, which is naturally sticky (duh), so the kids bit the Peeps' undersides off and licked them to maximize the stickiness. It worked better than the other methods, but things started devolving pretty quickly. It tastes like sugary sugared sugar. I accidentally ate it down to the head. Mommy, I drooled on my hat. I can tell you're dying to know how they turned out, right? (The hats, not the children - we're still not quite sure how the children are going to turn out.) To see the dramatic results, click over to CraftFail, where I've posted The Big Reveal. Go on now - it's quick, and you're not going to want to miss the results of all this (ahem) hard work. This post was sponsored by the peeps at Peeps, but the thoughts, opinions, and inability to competently use Peeps in a craft are all my own. You are hilarious! I don't think I'll try this. 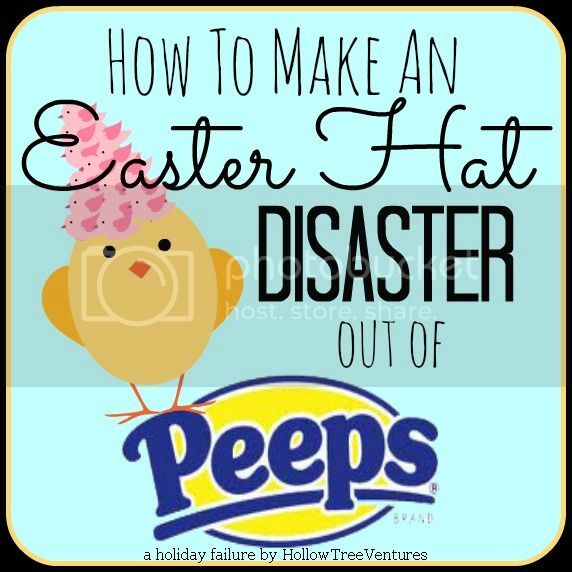 Not because I'm afraid of failure, but more because the peeps would never make it anywhere near any sort of hat. 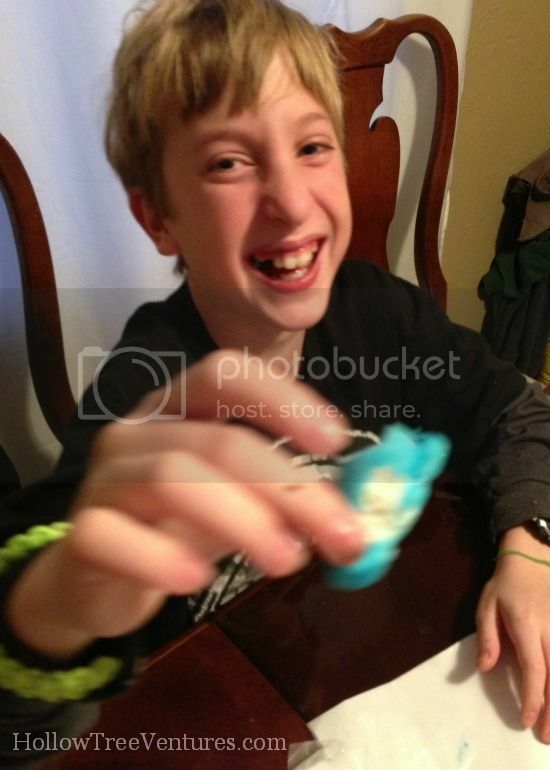 Unless, of course, my boys were also eating the hat. Keep crafting. I love the funny results! Some hat pieces may have accidentally been consumed, for sure, but really they could just eat the ones that slid off the hat onto their faces. :) Thanks so much! The ONLY think keeping me from attempting this is my terror of what would happen if I allowed my children such free access to that amount of sugar and artificial color. As usual, I shall live vicariously through you. You have WAY more guts than I do! They actually didn't go *too* crazy with them, mostly because they were laughing hysterically about biting the heads off (and the heads aren't very big). If they'd been eating entire Peeps, I'd probably still be trying to get them to sleep! half-heartedly heave a heavy helping of hovering halves of hummus, honey. Third Partier, what exactly are you huffing after I go to sleep? I love it! And next time it's hat day at school, imma make this here hat and send them in it! lol! awesome! This is great! I'm under a lot of pressure to come up with a prize winning Easter Bonnet for the family's annual Easter Games. I take it very seriously. I trolled Goodwill for an hour today filling my buggy with the tackiest of bunny figurines that could be hot glued to the top of a hat. I better win that damn blue ribbon, but if I don't, I hope someone gets salmonella from the egg toss. I'm just glad we keep it classy, and celebrate the true meaning of Easter. WTH? There's a true meaning of Easter?!? 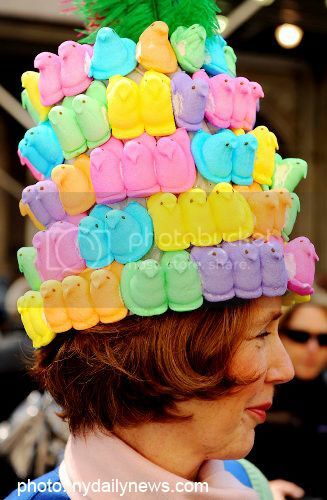 Okay, I'm a little in love with the Easter bonnet competition. You know I'm gonna need pictures, right? I'm voting a hard yes on the bunny tail. but not a real one. Haha. I totally saw your peeps hat there. It made me laugh out loud. So funny. And thanks for the video. I had to send it to my dad. He likes to leave his peeps in the cabinet exposed to air until they get stale. He then eats the peep very slowly with small little nibbles. We buy him many every year. Happy Easter!